At the close of play on Day 2, Derbyshire were in a horrible position to avoid defeat at Queen's Park in this LV= County Championship Div 1 match. The Falcons finished the day on 94-5, a massive 373 just to avoid the follow on! Yorkshire's 617-5 was the third highest ever score at Queen's Park since it first hosted championship cricket in 1897. Alex Lees did the damage for the Tykes, resuming on 171, when Yorkshire declared around half an hour before tea, Lees was unbeaten on 275. Lees' innings was the third highest at Queen's Park by any batsman, he made batting look so easy that Essex batsman Peter Perrin's record score of 343 not out, set in 1904, did look in danger of falling. The morning session started for Derbyshire pretty much how it started on the opening day, Yorkshire went at over four an over and Derbyshire gained one wicket. Andrew Gale who started the morning on 9, brought up his fifty a mere eleven overs later. Meanwhile, Alex Lees kept the score ticking along as he brought his 200 up from 321 balls. One success story Derbyshire had throughout the day was the bowling of 19 year old Championship debutant Peter Burgoyne. 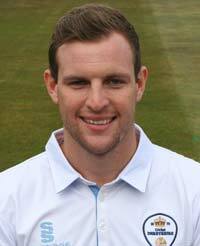 The off spinner gained his first championship wicket when Andrew Gale tried to sweep and was bowled for 74 off 98 balls, while Tom Poynton (pictured above) took two catches and a stumping. Former Derbyshire player Gary Ballance kept up momentum for Yorkshire and also found this an easy pitch to bat on, bringing up his 50 which including two massive sixes towards the bandstand. Ballance was out, stumped off Wes Durston for 66 soon after trying another big shot. Alex Lees continued to tick the scoreboard over and brought up the third highest score at Queen's Park when he smacked a Groenewald delivery over mid-on for six. Rashid was out next over, flashing at a wide one from Mark Footitt and immediately Yorkshire declared on 617-5. The third highest team score at Queen's Park and second highest by a Yorkshire side. A magical innings from Lees, he batted for over nine hours for his 275 not out and faced 436 balls, hit thirty eight fours and one six. Derbyshire had a tricky session of nine over before tea and they lost Chesney Hughes trapped leg before by Ryan Sidebottom for 12. Whilst local Chesterfield youngster Ben Slater and Wayne Madsen put on 35 for the second wicket, Madsen was next to go when he appeared to edge behind to Andrew Hodd from Steven Patterson. Initially, umpire Jeff Evans gave the decision not out, but Madsen walked and received a round of applause from the crowd. Wes Durston fell to Patterson two balls later, lbw for 0, and Derbyshire were quickly 52-3. Dan Redfern and Slater managed to put on 28 through some real testing bowling from Liam Plunkett and Patterson. However, it was Jack Brooks who was brought back on from the pavilion end to cause Derbyshire real trouble when he had Dan Redfern (12) and Ben Slater (28) both caught behind by Andrew Hodd. Derbyshire sent in night watchman Mark Turner, he and Richard Johnson managed to see through the remaining overs of the day.